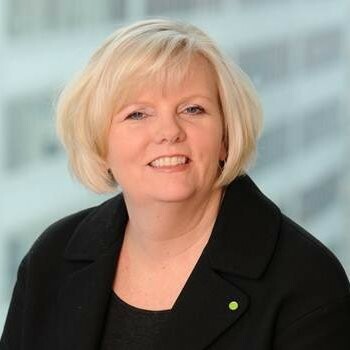 Heather Stockton - Global Future of Work Leader, Deloitte. 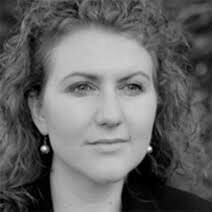 Mariya Filipova - Leads the Future of Work global program office, Deloitte. 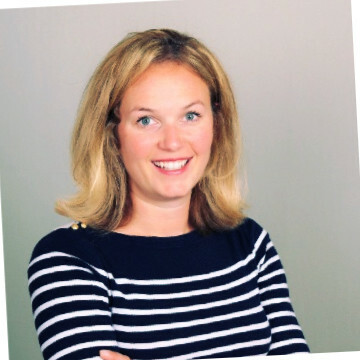 Kelly Monahan - Researcher - Future of Work, Deloitte. What could work look like tomorrow? GETTING work done is a fundamental concern for any business. But today, paradigm-shifting forces seem to be driving significant changes in both work and the workforce. New digital and communications technologies are changing how work gets done. The growth of the gig economy and advances in artificial intelligence are changing who does the work. Even the question of what work looks like is coming under examination as a continually evolving marketplace drives organizations to explore new business models. In the face of these technological and social forces, it could be imperative for businesses to rethink their approaches to the how, who, and what of work in fundamental, perhaps even transformative ways. And as usual, there seem to be no easy answers. While we anticipate that the future of work will be better in some respects than many of our present-day realities, we also anticipate much turbulence. The complexity of what lies ahead can make many business leaders feel as if they are navigating whitewater rapids rather than charting predictable courses of action. The research this report describes aims to bring some degree of clarity to the pressures organizations can expect as they move forward in the future of work. Through an ongoing research collaboration with WikiStrat, we examine leading experts’ views on the new realities that are emerging and ways in which individuals, organizational leaders, and public policy makers can take advantage of the opportunities that the future of work presents. The complexities and opportunities posed by the future of work may seem limitless, and they can present newfound realities to multiple stakeholders. And so, to better understand tomorrow’s most pressing issues, we tapped into the potential power of leveraging the wisdom of crowds. 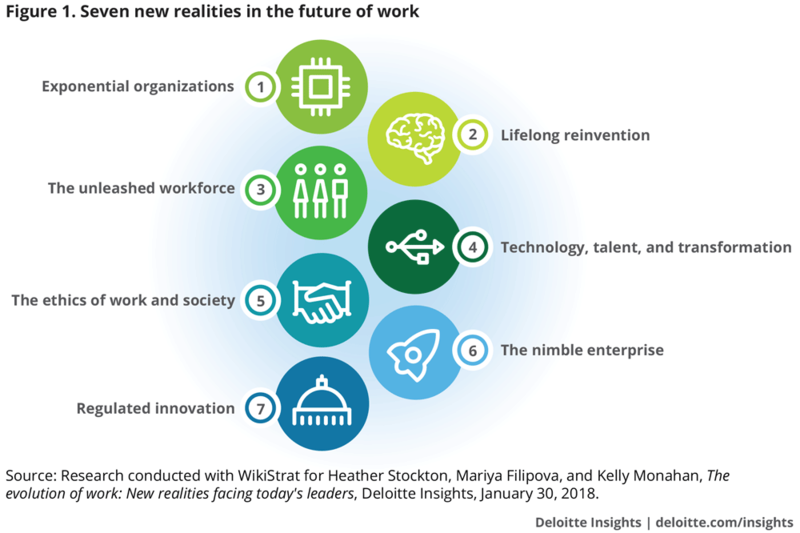 Considering a wide range of perspectives on the future of work allows us to view the issue from a variety of viewpoints, yielding a fuller picture of the transformations underway. As we gathered and unpacked the data during the study’s first phase (conducted in April 2017), five “new realities” emerged that were considered both highly probable and likely to have a big impact on global public policy makers, organizational leaders, and employees seeking to navigate opportunities in the future of work. Each of these realities holds untapped potential for further developing the workforce, leveraging technology, and advancing economic and social growth in newfound ways. The study’s second phase (conducted in November 2017) validated the five original realities and identified two additional “emerging” realities on the horizon (figure 1). The driving forces of big data, the Internet of Things, and the growing number of Generation X individuals in leadership positions have led to the rise of exponential technologies and data-driven organizations. Organizations that can capture the potential value unlocked by technology and data’s unprecedented availability are anticipated to outpace their peers. We often refer to these organizations as “exponential organizations” (ExOs). We define an ExO as one that has a disproportionately large impact (or output) compared to its peers, and that enjoys an exponential return on assets (such as talent, capital, or intellectual property). An ExO’s exponential return on assets may be largely due to the use of new organizational techniques that employ the right mix of exponential technologies, business models, and, most importantly, human talent. To successfully operate as an ExO, an organization should find the right mix between people and technology to scale impact and accelerate growth. ExOs seem to have mastered artful augmentation—leveraging the power of technology while further developing the enduring human skill sets needed to capture value in the market. They generally see technology, not simply as a way to create efficiencies and cut costs, but as a way to unleash exponential growth in abundant markets. They can redefine their markets and use data to create new industries (for example, the sharing economy and crowdfunding). One challenge to operating as an ExO is the pragmatic difficulty of getting one’s arms around the vast volume of data and information being generated. This volume is only growing; some estimate that 90 percent of the world’s data has been created in the past few years. We also often hear about the increased flow of information: 2.5 exabytes of data are produced every day, while 140 million emails are sent every minute.4 How then can organizational leaders prepare to harness data and information in the quest for exponential performance? A good starting point is to create a data-driven business model that focuses on customer value creation by relying on new data streams, technologies, and human talent to inform decision-making and redefine the competitive market. Harnessing a mix of data, technology, and people allows ExOs to create opportunities in untapped markets. It is also necessary to develop core business competencies like statistical reasoning, data manipulation, and data visualization. And, while ExOs focus heavily on science and data, they also place a premium on technical workers who can also leverage soft skills such as social interaction, creative thinking, and complex problem-solving. Factors such as the growth of freelancing, 24-hour everything, mobility, crowdsourcing, and gamification have unleashed the workforce, freeing it from many traditional bounds and constraints. Indeed, one of the fastest-growing workforce segments is the “alternative” worker—one who works off-campus and outside of an organization’s official talent balance sheet.6 In addition, the rise of platform technologies has made it easier for organizations to use crowdsourcing to tackle tough challenges. And technologies such as artificial intelligence, augmented reality, and robotic process automation allow work to be outsourced to robots. This broadening of the talent continuum gives employers an opportunity to engage in a multi-channel workforce strategy that leverages a mix of traditional full-time employees, joint ventures, contractors, freelancers, crowds, and robots (figure 3). To reap benefits from this new reality, successful organizations can leverage team-based models and decision-making protocols rather than building traditional hierarchical business models. Agile companies can draw upon all points of the talent continuum to rapidly shape new business models, improve output quality, generate ideas, and manage costs. At the same time, effective organizations also recognize the different needs and specific attributes of different worker types along the continuum. They do not take a one-size-fits-all approach to the employee experience. Key insights: Public policy makers should consider new labor categories to account for the rise of alternative work arrangements, paying particular attention to social safety nets and tax incentives that could offset the impact of income uncertainty among an increasingly transitory and ephemeral workforce. Organizational leaders may consider moving away from traditional hierarchical structures toward project-based teams composed of a variety of workers, which can allow them to respond faster to marketplace needs and opportunities. Individual workers should plan for and adapt to perhaps greater uncertainty about where and when their next job will be, as well as embrace lifelong learning with an increasing emphasis on essentially human, enduring skillsets. The lengthening of the productive years (figure 4) and the need for lifelong learning have led to the new reality of lifelong reinvention. Longer lifespans seem to be challenging traditional ideas about careers, retirement, and work-life balance, and these changes in mind-set are starting to affect the way people work. Lengthening worker careers could complicate operational and resource management. The effectiveness with which organizations can manage quadri-generational workforces may affect business efficiency and productivity, investment decisions, and resource retention. Extended careers might redefine worker and management attitudes toward ageing, alter the pace at which organizations are renewed by younger talent and new ideas, and increase intergenerational competition for jobs. Lifelong reinvention can be enhanced by leveraging the strengths of each generation. St. John’s university professor Nicos Scordis has remarked, “There is an implied assumption that all future young workers would bring to the workplace superb skills. The reality might be different. It might be that the value of older workers might actually improve, not for their productivity, but rather as role models for their work ethics.”12 The use of mentoring models is likely to rise in this new reality, with older workers teaching early career workers interpersonal and leadership skills, which often develop with experience. Key insights: Individual workers should make education part of their careers, including engaging in both traditional and on-the-job training opportunities. Organizational leaders will likely want to consider implementing flexibility policies that are suitable for and inclusive of workers of all ages. Public policy makers should try to ensure the adoption of and adherence to anti-discrimination and anti-ageism laws across industries and sectors. The falling cost of automation, an increase in the use of artificial intelligence, and the rise of human-machine collaboration have created a new reality of talent trade-offs and transitions. This reality presents the opportunity to reimagine the economic value of work through the increased productivity that human-machine collaboration can bring to the workplace. While the impact of automation currently remains largely concentrated in a few industries and countries, it is nevertheless spreading across industries, including services industries and the public sector. 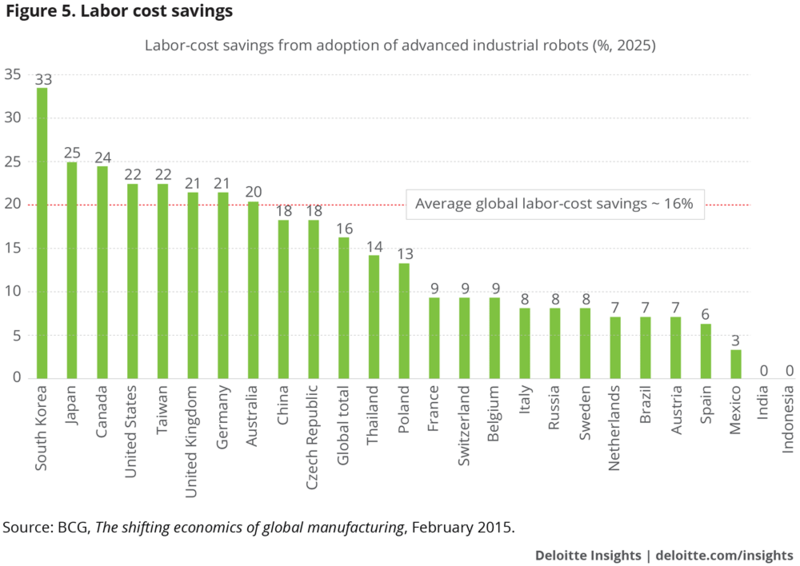 (Figure 5 highlights how different countries are using robotics in response to rising labor rates.) Automation is also gaining ground in developing countries, although one challenge to its widespread adoption is that many emerging economies are long on labor and short on technology. In addition, the establishment of automated factories in more-developed areas of an emerging nation may create social and political tensions within the country as well as with other countries. Agile organizations assess and reassess the mix of human and machine talent at all levels as an essential element of their business and strategic planning. Getting it right could significantly affect an organization’s productivity, competitiveness, and positioning. Organizations should prepare for a multiyear, complex transition period as jobs and careers are assessed and reassessed, technologies become more capable, and legal and social safety nets evolve. Key insights: Public policy makers should consider increasing incentives for lifelong learning and skills development while developing safety nets for workers disenfranchised by new technologies. Organizational leaders should brace themselves for potential rapid disruption caused by technological advances that could require substantial talent restructuring. Individual workers should seek to identify and target employment opportunities in areas where the demand for human workers is likely to increase, while also understanding and learning technology skills for sustainable employability. The driving forces behind our fifth new reality seem to be the economy of good deeds and a rise in discussions around the need for universal basic income. The evolving clash between traditional conceptions of work, societal values, and public policy may define the limits and conditions placed on the future organization. Developments such as artificial intelligence and job market fragmentation could produce large-scale shifts, changing how we think about work, what is valued at the workplace, and what is valued by society. In particular, worker demands appear to be pushing organizations to focus on worker interests—such as the effect of some technology applications on workers’ well-being—along with broader social benefits. New policies and programs might eventually be needed to balance organizational interests with the need to protect workers from the new working environment’s uncertainties. Key insights: Both individual workers and organizational leaders may need to develop a deep understanding of changing laws and employment regulations, especially as they relate to the alternative workforce. Organizational leaders should also reinforce ethical behavior and responsible conduct as a core management principle. Public policy makers will likely continue to develop regulations to protect workers. They may, for instance, establish watchdogs for artificial intelligence algorithms that could have a greater influence on hiring and firing decisions. Read more: Reimagining measurement: Enhancing social impact through better monitoring, evaluation, and learning explores ways organizations can more productively measure social impact.22 Cathy Engelbert and John Hagel’s latest Harvard Business Review article discusses ways that artificial intelligence is causing people to rethink the nature of work. The new realities we’ve discussed here can present a host of opportunities. But to capitalize on them, we will need to find new ways to align institutions, organizations, and individuals with each other amid rapid market shifts. Public policy makers, organizational leaders, and individual workers will likely need to invest time and effort to figure out how to work together, or at least avoid working at cross-purposes, in the current and future world of work. Yet doing so could ensure that the future of work is both productive and rewarding for all parties. Capturing the inherent value within each of these new realities could require many changes. It could involve reengineering work to take advantage of technological advances. It may require transforming workplaces to welcome and accommodate a continuum of talent needs. Almost inevitably, today’s organizational leaders will need much courage to upend their existing models of work to usher in a more nimble and diverse enterprise. Start to explore ways to tap into different parts of today’s talent continuum to accomplish work that is currently more expensive and less productive than you would like it to be. Emphasize human-machine collaboration, not competition—utilizing the strengths that each brings to the workplace. Try, test, and learn. Place strategic longer-term bets. Identify the most important value chains in your business, and invest in transforming work in these specific areas. Start small, experiment, and scale quickly. Consider ways in which your business can engage in a broader societal narrative. Younger generations, especially, generally expect businesses to play a positive role in shaping society and heling to address some of its most pressing issues. This article was originally posted on the Deloitte website. Reposted with permission. The opinions expressed in this article are those of the author and do not necessarily reflect those of Tucana.